Philip Blumel: Hi. I’m Philip Blumel. Welcome to the No Uncertain Terms podcast for the week of December 3rd, 2018. Now that the elections are over, it’s time to roll up our sleeves and get down to the real work of imposing term limits on the US Congress. During the 2016 mid-term elections, we collected pledges from state legislators across the country who are now in office and are committed to assist us in the next crucial steps of our program. Recall that our aim is to call for a national term limits convention under Article V of the US Constitution, limited to the subject of congressional term limits. To achieve that, 34 state legislatures must pass the term limits convention resolution. So far, Florida, Alabama, and Missouri have done so. We expect the term limits convention resolution to be introduced in about 10 more states this year. US term limits is committed to focusing resources on six target states: Arizona, Georgia, Kentucky, Utah, and West Virginia, and one, so far, unspecified state. Keep in mind that in three of these states, Arizona, Georgia, and Utah, the term limits convention resolution did pass in one house of the legislature, but not the other. Philip Blumel: This plan is working. We need to maintain and build on last year’s momentum. In our target states, our state directors and volunteer networks have been laying the groundwork for the 2019 sessions all year, and now we’re gearing up for up or down floor votes next year in multiple states. As part of this effort, US term limits executive director, Nick Tomboulides, was in Washington, D.C. last week for the 2018 states and nation policy summit, sponsored by The American Legislative Exchange Council. Here, he met with state legislators from all over America, talking about the term limits convention resolution, and he captured some of their reactions. Nick T.: We are with representative, Kelly Townsend, from the great state of Arizona. You have term limits in the state of Arizona. You were elected under term limits. What has been your experience there? Why do you think term limits would be a positive change at the federal level? Kelly Townsend: Well, Arizona has a unique form of term limits in that we can go from one house to the other and then back. So, there are term limits, but not like what you might think. One of the challenges is, is preserving institutional knowledge with new legislators coming in. It has been my effort over the last six years to put together trainings and preserve that institutional knowledge so that when people move along, we don’t lose that, because that is important. That’s one of the arguments against term limits, is that you do lose that institutional knowledge, but I think there’s a way to overcome that. Nick T.: Yeah. I couldn’t agree more. With respect to institutional knowledge, it’s important, when you have term limits, to strike that right balance between allowing people to get experience while also not allowing them to become too entrenched and balancing that with the need for fresh ideas. I mean, if you look at states like New York and Illinois, they have all the institutional knowledge in the world, but it’s being used for all of the wrong reasons. Basically, the legislators are so smart and so experienced, they found a way to turn these states into their own personal piggy banks. Pivoting back to the legislative effort to pass a term limits convention, where does that stand right now in Arizona? Kelly Townsend: It’s interesting. Term limits was my first thought of where to go with Article V. It was a new thing back in 2013-2014. Folks weren’t really sure which direction to take it, and it’s kind of come full circle that there was other efforts that had more grassroots effort behind it, and that came to the forefront. We’re all still interested in a balance budget amendment, very much so, but it has come around full circle that we need to do a single subject term limits resolution because I think that is what gets to the finish line first. Because of the bipartisan nature, you’re gonna need 38 states to ratify it. We don’t have 38 red states, and we don’t have 38 blue states. So, I do believe that term limits is going to be the first convention. Maybe I’m proven wrong, but I would put my money down on term limits at this point. After looking at this for several years, I think this is where we go first, and I think it will be successful. Nick T.: How were you able to win over your colleagues and build support for this within the Arizona house? Kelly Townsend: Okay. So from my perspective, the single most important thing was educating other legislators about runaway convention and how that is protected and how that’s not gonna happen. Knowing all the arguments, the answers to the arguments, and I typically go straight to … Let’s say there was a runaway convention, and that group of legislators proposed a rogue amendment and managed to get it voted out, which I don’t think would happen, but let’s say they did manage to get it voted out. It would never be accepted by Congress because it wouldn’t be a legal amendment, but even if Congress did accept it and put it out to the states, you still need 38 states to ratify that. Anything too far to the right, too far to the left is not gonna get ratified, so it’ll be a colossal waste of time. Kelly Townsend: I usually go straight to that argument and talk about the fears. This is what people are afraid of. They’re afraid of a runaway convention, so let’s talk about what that looks like. It really isn’t gonna get anywhere because of the protections we’ve put in that if your delegates vote on anything else that is not in that call, they are recalled. They are subject to violations of the law, and it’s just not gonna get ratified. So, I think just really addressing those fears was what was most successful. When they bring up their questions and they bring up their fears, we’d go straight to the reality of, there isn’t gonna be a successful rogue amendment ratified to the United States Constitution. It’s just not gonna happen. Nick T.: Who do you think in Congress right now is the ultimate poster child for term limits? Kelly Townsend: Well, Mr. Byrd comes to mind right away. Crazy Eddie: Hi. This is Crazy Eddie with Best Congress Money Can Buy. That’s right. Best Congress Money Can Buy is having a Black Friday special. Have we got some amazing deals for you. Right now, one time only, don’t miss it, you can get yourself elected to Congress for only $2.5 million. That’s if you’re running against an incumbent. If you term limit the incumbent, it’s a lot easier to get elected. We’re also offering a BOGO special. Buy one Congressman, get one free. This is great for you oil company lobbyists who might be on a budget this year. It’s two puppets for the price of one. What’s not to love? Finally, we have big discounts on honest Congressmen. These are rare collectibles. Supplies of honest Congressmen are very limited. They will go quickly. Honesty, decency, and integrity will not last for as long as career politicians run the show. We know Congress is $23 trillion in debt. If your cash strapped, we understand. That’s why we offer layaway. Come on down to the Best Congress Money Can Buy for our Black Friday extravaganza. Limited time offer, not available in stores. Call 1-(800)-577-8038. Stacey: This is Stacey. I’d like to talk to you about how to pass a term limits convention resolution. As you know, the states have the power to propose and ratify a term limits amendment to the Constitution. Permission of Congress not necessary. On our website, we have model legislation that is short, just four paragraphs long, that describes the state’s desire to make application for a national convention to propose a term limits amendment. So, what’s the process of passing this resolution through a state? First, a sponsor is identified in each of the state’s chambers, the house, and the senate. This person will sponsor the language in his or her respective chamber. There, it will get assigned a number, like SJR24. SJR would be a senate joint resolution, and HR would be a house resolution. Stacey: The naming convention varies in each state. During this time, we also get bipartisan co-sponsors to support the bill. It’s actually not a bill because it doesn’t enact a law. It is technically a resolution or a memorial. The resolution typically gets scheduled for one or two votes in committee before heading to a vote of the full chamber. It is very important to assure the resolution gets to the vote state because it can’t pass if it doesn’t come up for a vote. Ah, the infamous death by committee. That’s why it is so important at this stage for our grassroots supporters to contact the committee members, urging them to get the resolution to a vote and to vote yes. Stacey: Since these happen quickly, we need our supporters to call members a day or two before the vote is scheduled. The turnaround is short, so we ask that you act promptly when you receive our call to action. It’s very important to obtain a successful vote in each committee to keep the bill alive on its path to the entire chamber floor. Because there could be three or so votes on the exact same resolution, you will receive multiple requests from us. However, it’s critical that you act on each one because we may be targeting different committee members. Our supporters need to be loud and proud about convincing legislators to sponsor, vote, and pass the term limits convention resolution. Stacey: Again, a successful application doesn’t need the signature of the governor or the president, and it doesn’t need the permission of Congress. The states are autonomous in the process. Our goal is to get 34 states to successfully apply for a national term limits convention. This would be a major milestone towards getting a constitutional amendment to term limit Congress, and we need your help. Be on the lookout for our emails so you can be part of the success story. Nick T.: I am with Senator Kevin Lundberg from the Colorado General Assembly. Senator Lundberg is a former lead sponsor of the term limits convention resolution in Colorado. He has a wealth of experience on Article V and constitutional reform. Senator, thank you so much for being with us. Kevin Lundberg: Well, it’s great being with you. I’m glad to be able to talk a little bit about what I’ve been doing and maybe what possibilities we have in the future. Nick T.: You have, like I mentioned, sponsored before the term limits convention resolution, which would have allowed Colorado and the rest of the states to effectively bypass Congress and implement a term limits amendment applying to the US House and the US Senate. Why do you think term limits are such a vital piece of the puzzle in terms of reforming our federal government? Kevin Lundberg: Well, it’s an interesting question for me right now because I’m going to be termed out in a very few weeks. Most people expect a legislator like me to say, “Wow, I don’t like term limits. I think they’re a terrible idea.” I mean, look at me. They’re kicking me out. Nick T.: I’ve already heard that 10 times today. Kevin Lundberg: Yeah, right, but for me, I entered the legislature, I believe, because of term limits to start with because the political environment in my district, it was such that I’m not sure I would’ve had the opportunity to serve in the first place, had it not been there. I’ve been there 16 years. That’s a good long while to get things done and figure things out, and I’ve also learned that there are a lot of opportunities to make a difference out of elected office, as well. I continue to be a fan of the term limits idea, even knowing it’s a double-edged sword. Kevin Lundberg: There’s some upside and downside to the whole thing, but I see it as being that opportunity for we, the people. In this case, I, the citizen, conserve the legislature because the guy in front of me was actually termed out. It gave me the opportunity to step in at the right time and play my role as a citizen legislator. This is an important concept, too, because our nation wasn’t founded on professional politicians, the idea that, well, we’ve got a professional ruling class and then everybody else. No, we, the people are to govern ourselves, and some of that is through serving in government. Hence, term limits helps enforce that concept into the reality of what occurs in our government systems. Nick T.: Having served in Colorado where you have had term limits in place for about 20 years now, what do you see in terms of the diversity of experience? Do you get more people who are from a diverse array of backgrounds as a result of having that periodic rotation? Kevin Lundberg: That’s a great question. In Colorado, we do have a very wide range of people. I know a lot of people assume, well, you must be an attorney. You’re in the legislature. Actually, that’s a rare commodity in the Colorado legislature. I can think of maybe four or five of the hundred legislators there that I know are attorneys. Some might have a degree, but they’re not practicing, but yeah. We have school teachers. We have farmers. We have people who have worked in various crafts or other professions, medical people. That’s what it’s supposed to be. Now, another important distinction between Colorado’s legislature and some of the others, like you mentioned, Illinois, is we’re part-time. Kevin Lundberg: That’s intentional. That’s because we want people who have a life outside of the legislature. For four months out of the year, we’re in session in Colorado. Some states is even less with a part-time legislature, but I believe it’s a better mix. I saw an interesting analysis several years ago where they compared the economic vitality of the state to whether it was a full-time or a part-time legislature. What do you know? The states with the most vibrant economies have a part-time legislature because the legislature is now made up of people who know what it’s like to go out and work a job and to live your life outside of the capital environment. Nick T.: Right. So, we’ve established that term limits is a good idea, but how do we actually get it done? Because, as we know, turkeys are not fond of Thanksgiving. We don’t think Congress is ever going to propose this amendment. You have been a leader in the Article V convention movement, which has been described as a safety valve. Why don’t you tell us exactly what that is and why it is the solution here? Kevin Lundberg: Now, understand that that doesn’t mean that the states can do it unilaterally without any input from Congress, but the states can initiate issues that the Congress is not willing to take on, and term limits is certainly one of those. When I saw that there was an effort for a specific term limits resolution, yeah. I said, “Sign me up. Let me try to do this.” In Colorado, it’s become a tough row to hoe, but I believe that we need to, as states, initiate the term limits concept at the federal level through Article V. I’ve been doing what I can, and will continue in the future. I don’t know whether we’ll be successful, but I know that we need to try because that’s our job at this point, is to try to improve our government system. Term limits at the federal level would go a long way towards curing a lot of the … Well, draining a lot of the swamp. I’ll just put it that way. Nick T.: Sure, yeah. What Senator Lundberg just described is the term limits convention. That is the centerpiece of activism for US term limits. If you’re interested in getting involved with that, please go to TermLimits.com. Philip Blumel: In a move to consolidate his power, Chinese President, Xi Jinping, earlier this year, pressed for and got an amendment to the Chinese Constitution to eliminate presidential term limits. Shortly thereafter, CNN got ahold of a recording of US President, Donald Trump, speaking at a private engagement in Florida that it presented as even more ominous. Donald Trump: [inaudible 00:17:29] is great, and Xi is a great gentleman. He’s now president for life. President [inaudible 00:17:45]. Look, he’s able to do that. I think it’s great. They want to give [inaudible 00:17:49]. Philip Blumel: Pundits dutifully voiced shock and awe as they do whenever the president speaks, but the president finally put these fears to rest in an interview with Chris Wallace on FOX News Sunday in November. Donald Trump: I would give myself an A+. Is that enough? Can I go higher than that? Chris Wallace: Can you envision a situation? You’ve talked about six more years. Can you envision a situation well into your second term where you think that you’re so good for the country and so essential for the progress of the country, that you would try to amend the Constitution so you could serve a third term? Donald Trump: Just won’t happen. I think the eight year limit is a good thing, not a bad thing. Philip Blumel: As protective as we are about presidential term limits, we didn’t lose any sleep about Trump’s comments. He was clearly joking around with friends and supporters. Besides, at US term limits, we know how hard it is to amend the Constitution to add term limits, a move supported by 82% of America. Imagine trying to remove them. During the 2016 campaign, President Trump promised to push for congressional term limits. He sided the 6 year House and 12 year Senate term limits that are specified in the US term limits congressional pledge, the one that about 70 sitting Congress members have side. Philip Blumel: After Trump’s unambiguous promise, sitting President, Barack Obama, was asked about it by the media. He opined that term limits are a good thing. We agree, and we’re still waiting for President Trump to fulfill that promise. Stacey: You can help get term limits on Congress right now. Don’t wait until legislative session in January. Make an appointment now to see your state senator or house rep while they’re still in your home district before the holidays and before he or she heads to the capital for legislative session. Let your lawmaker know he or she needs to support a resolution for term limits on Congress. Get them to sign our pledge at TermLimits.com/pledge and bring some friends with you. The more, the merrier. If you’d rather send an email or make a phone call instead, we make it easy for you. Find out more at TermLimits.com/legislators. Nick Tomboulides: This is Nick Tomboulides’ executive director of US term limits with Dan Larson, State Representative from Wyoming. Dan is a member of the federalism and international relations taskforce. He has been one of the leaders on Article V and trying to force a term limits convention by going through the state legislatures, as opposed to relying on those folks in Washington, D.C. Dan, it’s great to have you on. Dan Larson: Well, thanks a bunch. Nick Tomboulides: Dan, why do you think it is important to have term limits for members of Congress? Why is that something that you support? Dan Larson: My biggest reason would be that anybody that wants to run against someone that’s presently there in re-election, you just don’t have the funds. You don’t have the dollars that they have, that they’ve built up, their war chest, I guess I’d call it. Nick Tomboulides: Yeah. It’s pay to play. If you’re not paying, you’re not playing in Washington. What we see is about 95% of special interest pack money goes to the incumbents, and so you’re really sailing into the wind. It is not possible, in most cases, to dislodge someone who has been in office for that long as that entrenched. Now in Wyoming, you guys only have one Congressman, right? Nick Tomboulides: That seat does not open up very often. Dan Larson: No, it doesn’t. It did a couple years ago, and it was a pretty good battle. Of course, our primaries are the main focus, but I think they spend pretty good money, for Wyoming, anyway. You only have half a million people or so. Nick Tomboulides: Let me ask you this, Dan. What do you think is the better term limit? One in office or one in prison? Dan Larson: Oh, whoa. That’s a tough one, I think. Oh, I’d say one in office is where we need to be. Nick Tomboulides: Awesome. Are there efforts underway in Wyoming right now to have Wyoming call for a convention for term limits or other subjects? And how is that going? Dan Larson: We did last year. We’re just having a tough time in the house in Wyoming. It’s a subject they don’t really … They’re not so excited about. The difficult part is that trying to get one past, we just need to decide which one might have the best luck. Maybe this one would be it. Nick Tomboulides: Yeah. If you look at the polling, nationally, it’s 82% overall. It’s 89% of Republicans, 83% of independents, 79% of Democrats. It’s really a very bipartisan issue. Dan Larson: In the population, it’s that way. The tough issue, like you know, is take it to your house and you have fellow legislators, and they all want to say the same thing. Dan Larson: Well, what they say is, “We have term limits, and it’s the voters.” But, you know. Nick Tomboulides: We thank you so much for your support. You have been a true ally of this organization over the years. I just want to ask you one more question. Wyoming has a part-time legislature, right? So when you are not a Wyoming legislator, what does Dan Larson like to do? Dan Larson: Actually, I go to work like the rest of the people out there. That’s what’s so neat about Wyoming. It’s a citizen legislature. We meet 60 days in a biennium. In two years, we’re limited to 60 days. That’s what it ought to be. Nick Tomboulides: I would pray for that to happen at the federal level. Thank you so much, Dan. Speaker 12: This is a public summit announcement. Bernie Shamders: Hello. This is Senator Bernie Shamders to talk about the term limits movement. Let me be clear. I have been in Congress since the dinosaurs were walking the earth. I do not favor term limits in any way, but I will tell you that the term limits will get rid of the 1% of the 1% of the 1%. Once you get rid of the 1% of the 1% of the 1%, that plus the 99% will somehow make a difference, but there’s no doubt that our politicians are controlled by Wall Street. The banks and the hedge funds spent $2 billion in the last election cycle, buying our politicians, getting bailouts, getting subsidies, and getting special favors, which, to me, is unacceptable. I will never admit to you that we need term limits because that would also affect me, and I like keeping my job. It’s fun. It’s a nice job. However, there is no doubt, the arguments, the term limits people make, that these career politicians are out of control, that they are corrupt, and that the system is not working for the average guy. These arguments all have merit. Sincerely, Bernie Shamders. Nick T.: I am with State Representative, Mike Sparks, from the great state of Tennessee. Mike, how are you doing? Mike Sparks: How are you doing? Good, Nick. Glad to be with you. Nick T.: What do you think? You think Congress needs term limits? Mike Sparks: I do think that they do. I mean, I’m at the local level. I was a county commissioner for eight years. I’m a state rep now. I’ve been there for eight years there, going on my fifth term, which will be nine years. I mean, some could argue, “Well, Mike, you should have term limits.” I do think experience has a lot of value, but I do feel like if you’ve been up 25 years-30 years, I just have a hard time with that, especially when I’m not seeing people involved in the community. I think they get a little disconnected, especially up here in D.C.
Nick T.: Who do you think in Washington, D.C. is the biggest poster child for term limits? Mike Sparks: Would it be Pelosi, I’m guessing? Philip Blumel: We’ll be talking to a lot of state legislators of the next few months as the term limits convention bills are introduced in state legislatures and committee hearings begin. It’s good to know we have some friends in these capital cities who keep their promises. Even Bernie Sanders appears to be coming around, at least when impersonated by Nick. Hey, we take what we can get. Philip Blumel: As always, we appreciate you listening and supporting our podcast. If you have not already done so, please subscribe. Use the podcast app on your iPhone, or Stitcher, or Google Play on your Android device, or go to iTunes and write reviews while you’re there. Thank you. We’ll be back next week. Stacey: The revolution isn’t being televised. 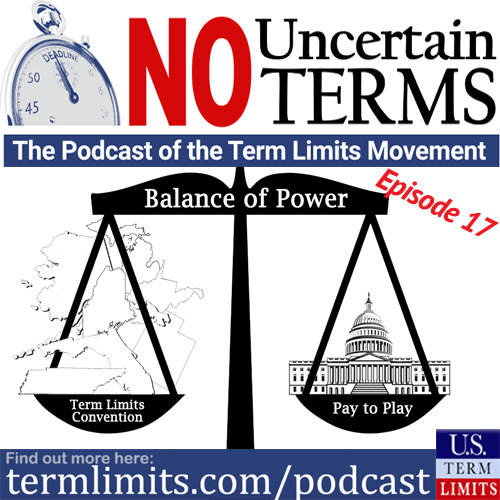 Fortunately, you have No Uncertain Terms podcast.